View cart “Opulence II Save the Date Card” has been added to your cart. This elegant save the date card is digitally printed on both sides of premium 110# Pearl Ice Metallic Shimmer stock. Three Star of David motifs appear at the top and have a faux gold foil leaf appearance against a black background. 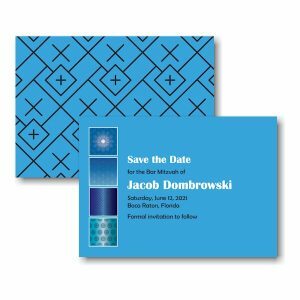 Your wording details will follow below, and the words “Save the Date” and the name of the Bar Mitzvah will also appear with the faux foil appearance. This elegant save the date card is digitally printed on both sides of premium 110# Pearl Ice Metallic Shimmer stock. 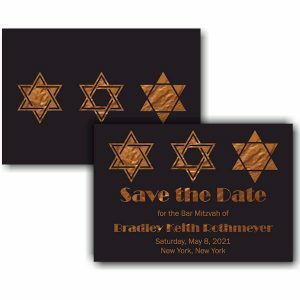 Three Star of David motifs appear at the top and have a faux gold foil leaf appearance against a black background. 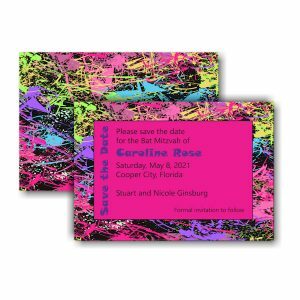 Your wording details will follow below, and the words “Save the Date” and the name of the Bar Mitzvah will also appear with the faux foil appearance. The matching stars are centered on the reverse side. Measures 5″ wide by 3-1/2″ high. Shown with gold ink and combination lettering styles Franklin Gothic Book and Broadway. Single bright white envelopes accompany this save the date card. Metallic Shimmer Gold Leaf envelopes are available as an upgrade. Single bright white envelopes come with this save the date card at no additional cost. You may upgrade the envelopes to Metallic Shimmer Gold Leaf envelopes at a cost of $0.70 per envelope (before the discount is applied).